How many of you like more alignment in your organization? How many of you would like more of both in your organization? – The difference between aligned and misaligned teams/organization, is the difference between average and excellent. When strategies are misaligned with culture, organizations and businesses pay extremely high price. Aligned teams happen to be more creative, innovative, perform faster and better in the changing environment. Leaders and entrepreneurs need to be able to create safe environment where the collective intelligence emerges, people align and continuously innovate. The Diamond Leadership book is a simple co-creative guide that puts in one place the tools and practices that liberate innovation and align teams in organizations. It will assist you to create alignment in your team where creativity and innovation are natural states of functioning, emerging “by design” not by chance or accident. How to create organizational culture that liberates employee’s creativity, innovation and productivity? How to create conditions for systemic transformation and re-innovation, by building containers and hold space for generative dialogue? Haw to use the newest leadership models and practices that create team cohesion, enhance collective intelligence, stimulate systemic thinking and produce cultures of innovation? 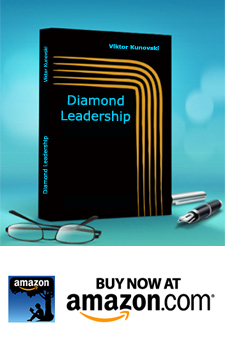 The Diamond Leadership book is available on Amazon Kindle Amazon.